Just a quick reminder of the next gig I’m playing on Friday 30th May 7.30, at a delightful 16th century house just down the road from where I live, called Bishop’s house. I’m playing with my Garden duo, alongside Martin Archer and Meson. Here’s a photo from a previous set there. Large corporations are often accused of overlooking the “little guy”, so when I tried to source three knobs for my (discontinued) GP100, I held little hope when emailing Roland. How wrong I was, they said they had none in stock, but could have them shipped over from Japan if I would pay the postage. How much would the total package come to? A whapping £6.50! Cash paid, the knobs arrived within a week and had this cute receipt, listing KNOB and MR KNOB, weight zero! Nice one Roland…. As someone who grew became absorbed with music around the birth of progressive rock, there are a few keyboard sounds that I have loved ever since. 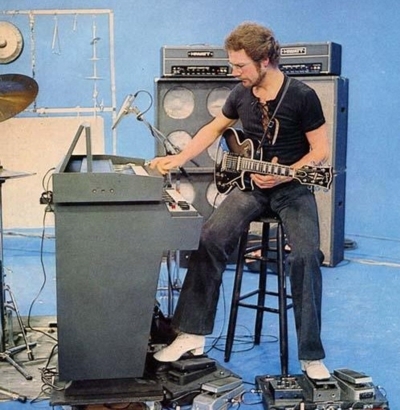 A Hammond organ, a Fender rhodes and a Mellotron. A few years ago, I bought a Roland Vintage Synth module almost solely because of the mellotron patches (recorded from the real thing). For years I’ve searched for a decent software emulation that doesn’t cost the earth and just today, I found it! Made by Artifake Labs it’s not only a wonderful VST plugin, but better than that, it’s totally free! Whilst I’d still love a real one, compare the cost (several thousand pounds) and potential maintenance of the real thing and it’s a complete no-brainer. Here’s a video demo. There are any number of textural loopers out there, but my friend Stephen is amongst those closest to my musical heart. Whilst totally unsung, he ploughs his furrow with considerable musical skill. Lost Garden – first gig! Our first gig will be at Bishop’s House on friday May 30th, alongside Martin Archer and Mark Hadman. For my covers band, Rachel & the Riffs, I’ve been running my Line6 M13 into a JMP preamp (with a stereo reverb send to a zoom 1201) then into a stereo power amp. Great sound, but I lose the stereo end of the M13. So, I’m switching back to a GP100 preamp. I’ve found out how to split the banks of the M13 so banks 3/4 are sent via the FX output to the FX send/return of the GP100. This will keep FX in stereo at all times and place the spacial effects where they should be, after the preamp. It means an extra set of cables, but this won’t add much to the setup time. I’ll need a midi pedal to select patches on the GP100, but I was using a similar device to select patches on the JMP1, so no extra gear overall. The GP100 will also have reverb running, so I can lose the Zoom from the rack. 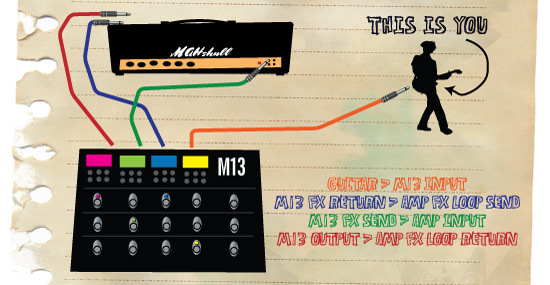 The other logic behind this is that I’m using the M13 for distortion to boost solos etc. This is more easily done by having the EQ section of the GP100 foot-switchable so whatever patch I’m using, one pedal will go into boost mode. This should reduce the reliance on the M13 for tone and allow me to set up scenes that are FX only, not tone or distortion. I can also go a step further and trigger patches on the GP100 that are set up for a given sound including things like compression, again reducing the M13 toe-tapping and scene switching. For many years I’ve bemoaned the fact that midi controllers are either inflexible, too darn large, or simply too expensive! So, I’ve decided to go down the DIY route and custom build one. Based on the amazing Arduino chip, this has only taken a few nights of soldering and quite a lot of getting my head round the C++ required to program it. There are loads of existing scripts to adapt. You write the code in the free debugging environment, then simply upload via USB and test! I’m using mine to send various midi CC messages to my rack jamman, to switch into fade, delay modes etc. I picked up an ART pedal for a fiver on ebay, a fee LEDs, wires and a midi socket and it’s actually working! I need to make it bullet-proof for live work, so will have to figure out how to mount the board firmly, with access to the power socket & USB. Part of the fun is the little subtleties you can build in. For example, when I go from loop mode into delay mode, I want it to flash when I’m recording something, but stay constantly on when the delay is frozen. This is easily achieved with a few lines of code. Having acquired an Echoplex Digital Pro which lacked the foot-pedal, I’ve extended my arduino to control it. The hardest part was finding a suitable casing – in the end, I bought a marshall f/s, covered the existing holes up and added new ones. I drew a visualisation of what I wanted (on the right), but as I started wiring the whole thing together, I found I’d run out of available arduino inputs. The finished delight is shown right. I now need to learn about multiplexiing, to merge more switches through a matrix (apparently!). However, the pedal works and has been used live. Occaisionally I manage to fool the programming logic and leds are on when they should be off, but I’ve coded a line to say long press=reset. I’d like to work on a mk 2, but need to find a suitable enclosure – let me know if you’re handy at bending aluminium!